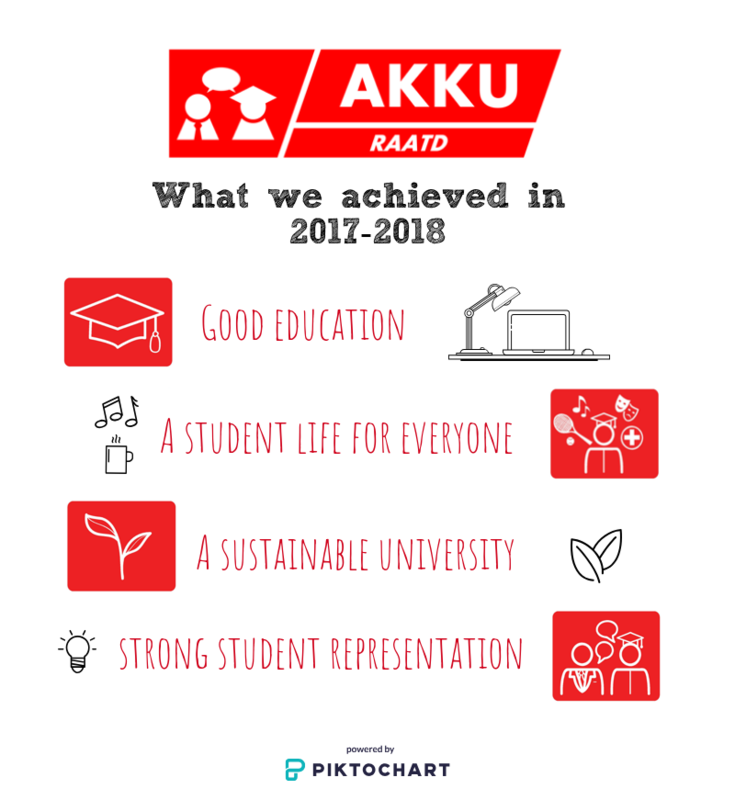 Every year AKKUraatd aims to carry out the points of our Politicital Program as best as we can. Are you interested in what we achieved last year? Read along! The Pilot Flexible Education has gained ground in the previous year. More students have opted into the pilot, most notably students with side activities, such as informal caregivers, student board members, and top athletes. The Pilot Flexible Studying which mostly focused on student board members turned out to have certain executive faults. AKKUraatd has been working on ways to improve informing the student body in the USC’s Active Student workgroup to also reach other target audiences. The communication to students will be set up on a large scale starting September 2018. In addition, it has been ensured that the Department of Student Affairs has informed teachers and student counsellors properly on student rights and duties within this Pilot. Finally, a coordinator for the Pilot was appointed last year, whose responsibility it is to test whether a student is eligible, also weighing the student’s personal circumstances. The Executive Board has decided to expand on an initial exploratory study into the effectiveness of the BSA by AKKUraatd. The Strategy, Education & Research (SOO in Dutch, red.) is now conducting a larger study, and we are part of the steering committee. Initial results show us that many of the students who get a negative BSA do not earn a lot of study credits (EC’s) to begin with. Therefore, we are endeavouring to detect this group of students earlier in the academic year and offer personal guidance in transferring to a different study program earlier. It is our hope that this will help students get the most out of their years. The faculties will already be seeing an extra 500.000 euros this year. They could use this for smaller-scale education. The quality agreements will probably provide millions more for faculties to invest in this. These investments pertain education innovation contributing to the small-scale; teachers will be able to use the time they spend with their students more effectively through these innovations. Simply hiring more teachers is a drop in the ocean. There is an increasing number of web lectures becoming available at our university. We have been giving thoughts on the next steps in consultation with the department of educational support: knowledge clips and e-learnings. Several pilots will be launched in this field, also funded from the extra 500.000 euros that faculties are receiving. Education boards have been instructed to formulate deliberate examination plans. These will be discussed with the Rector annually. In the coming year we will ensure that these plans are also discussed in the faculty representative body. That way, students within the program will get a say in the manner of examination. At our insistence, the faculties have been instructed to take inventory of any extra study costs and their corresponding free alternatives and to include them in their OER. These overviews will be the foundation for discussing which costs are truly needed and provides a guide for students to use the free alternative. This year we will be investigating whether these overviews have actually been produced. The academic community is larger than our own respective faculties. Both students and teacher are inclined to stay within the educational confines of their own faculty, while there is so much more to discover outside. The Radboud University hasn’t been crowned the best broad university for nothing! During an interfaculty exchange day, professors provide a lecture at a different faculty. This way, students are given a low-threshold opportunity to learn about different subjects, which may encourage them to opt for minors at different faculty. In addition, teachers are given the opportunity to look at how colleagues from other faculties have shaped education. That way, educational broadening takes place within our university, which AKKUraatd believes to be beneficial to the overall quality of education. This year ‘Radboud Open Air’ was organised as part of the Radboud University’s anniversary: A day during which researchers from several faculties gave lectures on their fields on a different location on campus. The university has been willing to transfer the event’s production script to AKKUraatd. Therefore, there will be opportunities for AKKUraatd to organize such a day in collaboration with the university or its faculties. A student life for everyone! Last year, the Radboud University has provided broader opening times for its libraries during exam periods, allowing students to spend more time in the library more often. It has been shown that there isn’t a need for more student psychologists. While the psychologists are busier sometimes, students don’t have to wait long for an appointment. However, it does appear that students have difficulty finding the right individual at the university to help them with physical or mental health problems. AKKU(raatd) has therefore insisted that students should be able to find this information easily online. Law students no longer have to attend the first class on an empty stomach, because since March breakfast is available at the Coffeecorner in Grotius. The products composing this breakfast do not have to be thrown away if they are not sold. There has been an update of the RU’s privacy regulations this past year. In addition, after addressing the issues surrounding the publication of study results, the Executive Board stated that there is no intention to disclose study results of individual students. The Executive Board and the Director of Student Affairs have written a letter to each faculty, noting that the only channels for distributing study results are Osiris or the personal page on Brightspace. The pilot for cultural ticket hours has run its course and given a green light for the future. So far there are seven classes pertaining to a cultural discipline, such as theatre, literary writing and photography. The Profiling Fund has been rigorously changed. While previously focusing mainly on study results and duration, focus has now been shifted to the individual. In addition, every student entitled to board grants will be granted up to 8 board months unconditionally, regardless of study results or duration. If the board member is entitled to more than 8 months, they will write a personal plan. This plan will describe the ambitions and goals of the student on a personal and educational level. Each student will be individually decided upon depending on the fulfilment of this plan. In short, the Profiling Fund will be taking more account of the student in the coming years, with a lot more students receiving board grants. The diversity policy at the Radboud University used to focus solely on the position of female staff members. In response to our questions, we were promised that in the new diversity office construction, more attention will be paid to cultural diversity and students. We are committed to having money be made available for this in the quality agreements. Contact with the Dictatencentrale has made it clear that there is more and more use of digital dictations and that paper dictations are rarely used. The Radboud University is trying to keep this number as low as possible. In addition, the number of computer and laptop workspaces has increased due to new construction on campus. The management and law faculty have also started separating its waste. However, not all faculties provide this possibility yet, which is unfortunate. Therefore, we will continue to commit ourselves to this. The Executive Board has stated it no longer wants to shrimp on costs for sustainability when building new real estate, which is a definite step in the right direction. However, there is a long way to go to realize a sustainable on the campus as a whole. This year, the Radboud Green Office was launched on our campus: A place for both students and employees to go to for help in realising initiatives in sustainability. The preparation trainings for OLC and USC members have been improved. Furthermore, faculty student councils have been given a 50% vote regarding the spending of study advance funds.